Pizza. Pizza... Did I Say Pizza? Late summer is the time for pizza. Nothing says summer like a nice slice on the street or waiting for the pizza to be delivered. We love pizza. We adore it. We worship at the temple of the Great God Zza, He of the dripping cheese and crusty perfection. It's not enough to eat pizza, one must know pizza: one of my favorite food blogs is Slice, the pizza blog. Of course, on a more realistic level we live in Budapest, which is not one of the world's great pizza towns. Sure, we have pizza in Hungary, in fact we have a lot of pizza - after 1990 pizza became the substitute for most Eastern European medium-fast foods. Before 1992 the late night munchy target of Hungary used to be the meleg szendvics, a toasted slice of bread with melted cheese and ketchup dreamed up in imitation of the bakery pizzas which were the only thing Hungarians could ever afford to eat when they visited Italy back in the days when you could only leave Hungary with a limited amount of foreign hard currency. The meleg szendvics is the default mode for Hungarian pizza, and the reason that Hungarians always like to squirt ketchup on top of pizza. After the first Yugoslav civil war, Hungarian refugees from Serbian Voivodina began introducing the vastly superior Yugo pizza, and since then pizzerias sprang up everywhere. The problem is, most aren't very good. Most of the few decent pizzas - Okay Italia, Trattoria Toscana, or Terzio Cerchio - are too expensive to eat in the New York manner, meaning downing one or two a day. The only option left: make it at home. This is where having an obsessive baker living in your home helps. Fumie bikes across town in search of flour with the proper gluten levels, and she will get up at two AM to check on how her sourdough culture is doing. Pizza dough is a cinch for her. For some reason, Fumie loves to bake on those days when the thermometer breaks record highs and everybody else heads to the beach. But nothing beats pizza on a hot summer day, right? At least we can get the basics: marzano tomatos for homemade sauce, basil we grow on our balcony, and for some reason locally made mozzarella cheese has become reasonably cheap and good lately. I've learned to go light on the toppings: basil, red onion, italian salami, anchovies... Last week we tried adding sliced mangalitsa bacon to the pizza. Utter FAIL.. the result was slimey... the mangalitsa basically just melted into tasteless pools of lard and dripped off the slices. Kids, don't try this at home! Mangalitza (a local breed of curly haired pig) is one of those products Hungarians laud as branded local "Hungaricums" within the EU, and not long ago we bought some mangalitsa pork chops to try with a friend who is a wine importer. Well... maybe it was just our pig, but the curly haired pig is bred for its fat, not for its meat. You can eat it, but... textureless, insipid, bland, entirely without character. The regular Hungarian pork that we get at any butchers is far superior for meat, so we'll be giving the curly hired pig a pass in the future. August 20 is the Hungarian National Holiday. It's a combination of holidays, actually, St. Stephen's Day, New Bread Day, and Constitution Day all rolled into one big do which culminates with fireworks over the Danube at night. The crowds along the Danube banks downtown are huge, and a couple of years ago a freak storm broke out just as the fireworks were beginning, flooding the streets, blowing giant fireworks into the city, and stampeding the crowd, causing injuries and several dead from boat accidents in the river. So, to avoid any possible apocalyptic destruction, we just biked up the street to the highway overpass here in Zugló for a clear view of the show going on downtown a few kilometers west of us. The overpass bridge was packed with people, who had brought out lawn chairs and bowls of popcorn for the event. Cars parked along the bridge, taxis waited for fares, and lots of the local Gypsy families were out enjoying the evening - this part of Zugló is considered to be the residence area of choice for better off Roma in Budapest. There was also an air show over the Danube during the afternoon, but scandal erupted when it turned out the sponsors, the Austrian makers of the putrid Red Bull Energy Drink - a vile sugary brew that tastes like bubblegum with caffeine - had paid off the city council to cancel the usual flyover of the Hungarian Air Force. So in the morning I got to see a formation of frustrated fighter planes angrily zipping past my bedroom window. We Own All the Salt Cod in Hungary. All of it. 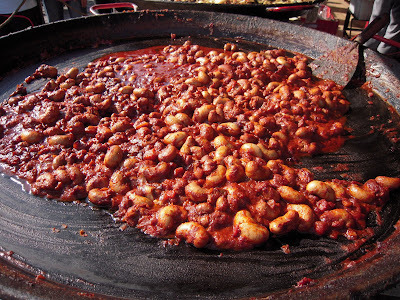 Hungary doesn’t really have anything approaching a “summer cuisine.” In summer, Hungarians eat the same thing they do in winter – soups, stews, things sautéed in paprika – but usually just a bit less. Vegetables are an afterthought, and fish is mainly carp, usually boiled into fish soup. We do not like carp. 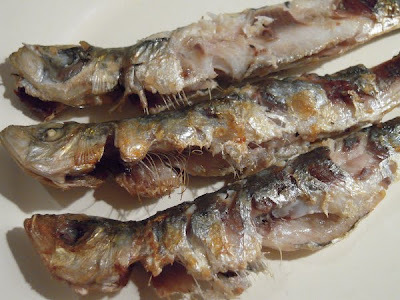 Fumie comes from Tokyo, I come from New York, and both of us were brought up next to fresh fish from the sea. Carp are fresh fish from irrigation ditches. How do we survive? Salted cod. Baccalà, bacalhau, bacalao, morue. We hoard the stuff. In our home we maintain what may be the the largest stock of salted cod in Hungary. It may be dangerous to say this openly - I can imagine hungry employees of the Portuguese embassy laying siege to my flat – but at any given time I probably have at least two kilos of non-perishable salted codfish in my fridge. Whenever we travel abroad I try and pick up a kilo or two, and my Mom helps by sending me some from the United States of New Jersey from time to time. I often wonder what the customs officials think when they find the bacalao packages – do they even recognize that this stuff is fish? Well, yes, it is fish, in fact, it isn’t even very strange fish, but the secret is in the salting and the soaking. Salted cod was developed during the middle ages in order to preserve fish to be packed inland from the sea. Since Catholics abstained from meat on Fridays and during Lent, salted cod became a valuable commodity, and evidence shows that Basque and English fishermen were catching cod off Newfoundland at least fifty years before Columbus sailed for the Indies. Not only were they catching cod, they were salt drying it, a process that can only be done on land. 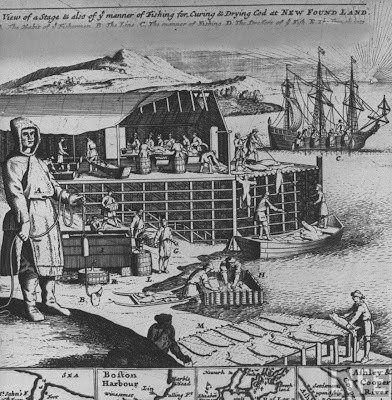 The cagey Basque and Bristol fishermen were not about to tell everybody where their fishy gold mine was, although Columbus himself spent several years sailing in the Northern Atlantic and probably knew of the Grand Banks fishery. 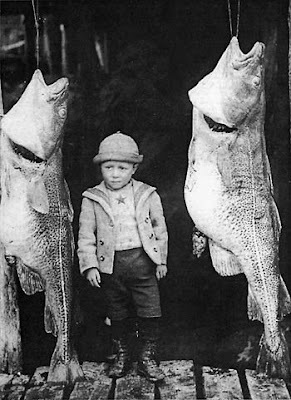 It wasn’t dreams of gold and spices that drove the Europeans to sail west – it was dreams of cod, almost as good as gold. Sadly, the amazing Atlantic cod fishery is over - the Grand Banks stocks collapsed in the 1990s, due to overfishing by factory ships using nets which destroyed the ocean bottom structure that provided the cod with breeding grounds. And it doen't look like the fish are ever coming back. Cod is no longer the cheap fish it was when I was growing up - it has become nasty expensive, in fact. What used to be a poor man's food is now one of the more pricey ingredients in traditional mediterranean cuisines. A good staring point for all things salted cod would be Mark Kurlansky’s Cod: A Biography of the Fish That Changed the World - a hard to put down mixture of history and recipes. The secret to good salted codfish is in the soaking. An overnight soak in water leaches out most, but not all, of the salt. Many recipes require a day long soak, but the result is bland, so we like to keep a bit of the salty taste if I am making codfish fritters or a pasta sauce. In Portugal, most restaurants keep cod soaking in vats varying from six hour soaks to two day soaks, and the customer can request his preference. The main characteristic of salted codfish is the texture – it is denser and meatier than fresh fish, and cod is a pretty delicate and soft white fish. In France the practice is to salt fresh cod - morue - in the market place to firm it up. 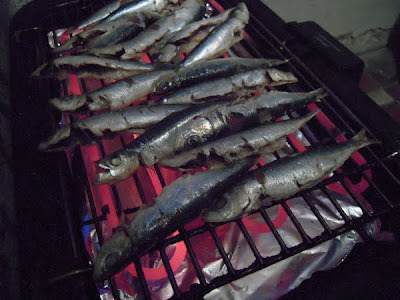 We’ve done this in Hungary using Alaskan pollack fillets from the supermarket, covering them in a bed of coarse salt for a day, which essentially cooks and preserves the flesh. Then we soak them for a bit to desalinate the fillets, and poach them in hot water as we do for hard salted cod. But it is never as dense and chewy as good bacalao. The mid summer doldrums are called “cucumber season” in Hungary. Nothing much happens, everybody is on vacation, and all the newspapers can report is that the cucumbers are ripening. I'm going a bit stir crazy, and you are all invited along! We’ve been taking it easy this summer – which is to say we can’t afford any big adventures abroad this summer and are most likely to be found biking around Zugló, our leafy district of outer Pest. One of the things I most appreciate about life in Hungary are open markets. Especially Bosnyak tér out here in district XIV. When I am back in the US I enjoy the convenience of the American supermarket and the range of foods you can get, but you really cannot beat the European farmer’s market for honest, fresh, seasonal food. In the US most people under the age of thirty have never bought meat from a real butcher. 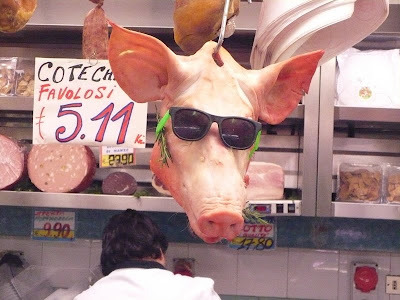 You know, the fat moustached guy who hands you a slice of salami over the counter to taste before hacking away at a hunk of cow and wrapping it up in brown paper for you? In the states, your meat is guaranteed to come wrapped in plastic with lots of stamps attesting to the free range, additive free, bio-friendly origin of the thing wrapped in plastic before you. In Hungary, as in most of Europe, we get our meat from a butcher, preferably in a marketplace where all you could ever want from a bird is available. Chicken heads, for example. Or chicken feet. You ever wonder why your chicken soup doesn’t have that rich yellow broth action going on? Boiled chicken heads and feet. About as expensive as buying soup cubes and much, much better. Not only chicken heads, but let’s push this "Nightmare on Poultry Street" theme one step further. How about turkey balls? Yes the word here is Hungarian for testicles. They live up inside the bird but they are definitely there, and people definitely eat them. Turkey balls are unfamiliar to me - we usually get fried rooster balls, and not only Magyars love them. I don’t actually go out of my way to search for them but I have had them fried… or as we mentioned in the spring there is rooster ball stew. I think the unspoken subtext of this ingredient is that it is "good for men" uhhuh uhhuh... Eat a plate of avian balls and inherit the strength of a turkey? Asian folk cuisine has lots of similar concoctions "for men" but I think cobra blood or endangered species bear balls make a lot better marketing/branding strategy than one that says "Men: You, too, can attain the strength of a chicken!" Of course, when it comes to actually playing with your food, nobody can beat the butchers of Italy in the creative department: Buying potatoes should be easy, but in Hungary we basically have one variety: the red, yellow fleshed, soft rose colored spud. If you want any other variety you have to search hard in the market. This is our onion and potato seller, who is a Hungarian Bulgarian who served in the Bulgarian army. He has... different types of potato! Large numbers of Bulgarians emigrated to Hungary during the revolts against the Ottoman Empire in the 19th century. They introduced specialized vegetable farming methods using raised beds, hot frame houses and irrigation methods unkown in Hungary at the time, methods which are still practied and are known as "Bulgarian" gardening. Bulgarians also introduced eggplants, squash, kohlrabi, and most of our Hungarian pepper varieties. They form a significant ethnic minority and maintain their language and position in the veggie retail trade. This guy basically fell for Fumie last year when she spoke Bulgarian to him while buying onions, and now he likes to tutor us - in Bulgarian - in the details of the artillary ordinance used by Bulgarian military units in WWII. You don't get chat like that at the Whole Foods on Houston St. in the Village. Biking homeward, we head down the former Lumumba Street. Back in 1990 most Hungarian cities went on a campaign of changing the old communist street names - gone forever were the Lenin Streets and Marx squares. Some of the more obscure lefty heroes, however, included the "Rosenberg Couple Street" right around the corner from the US Embassy, and, out here in Zugló, Lumumba Street, named for the Congolese leader Patrice Lumumba, whose murder at the height of the Cold War in 1961 pretty well guaranteed him a place in the commie street naming pantheon. Today, on Rona utca you can still see a few buildings that have never gotten around to renaming the block address markers. I kind of liked the idea of living near Lumumba Street. Just down Rona utca (the former Lumumba St.) I saw this shop advertising "Pi Viz." I'm not sure what that is, or why one would open a shop to sell it, but in my warped bilingual mind it says "Pee Water." Something to do with "Life Energy / Life Water = Pi Water." Obviously somebody is making a killing selling water. I just thought I should mention that. For another offering of life energy water, just around the corner is the "Base" drink shop. This is a classic example of a Budapest Booze dispensary - no frills, nothing fancy, not much in the way of fine bordeaux or Danish Aquavit or single maltwhiskies from the Gaelic speaking outer Hebrides. This is basically a dirt cheap cash and carry for drunks who don't want to pay the minimal markup to drink in a bar - just booze away in the parking lot next to the market. The sign is a good example of clear, direct advertising. Ah, Zugló, beautiful Zugló... always a pride of place and a home for everyone! Árus Feri Playing My Violin! Tranylvanian Fiddle Roots. I experienced a bit of a shock the other day when I was trolling about on Youtube looking for videos of some older fiddlers from Transylvania. 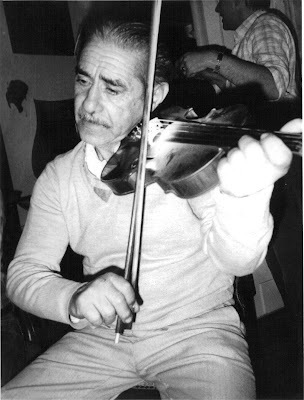 I found my old friend and fiddle mentor Berki Árus Ferenc or “Árus Feri” from the village of Méra (west of Cluj/Kolozsvar) playing a familiar looking violin. Then it suddenly hit me: that's my fiddle he’s playing! Árus Feri was one of the most influential musicians in my life. He taught me how to be a musician, not just a fiddle player. He would watch me play - I usually looked at my fingers when learning a new tune - and tell me "Don't play from your fingers! Play from your heart!" He taught me the inner world of Romanes – the world inside the boundaries of the Romani language. 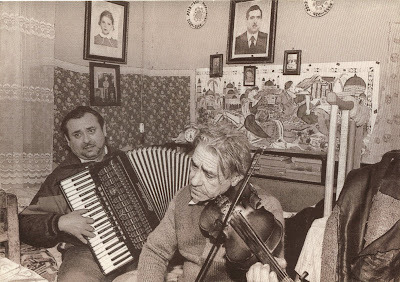 The son of the legendary fiddler from Méra, “Old Árus” who died in 1977, Feri was an extraordinary dancer who was studied by the nascent Hungarian folk music scene for his slick moves during the legényes, or lad’s dance. Indeed, there is a photograph of him dancing with his wife Rózsinéni in the 1972 National Geographic book “Gypsies: Wanderers of the World”. That picture planted the seed that eventually led me to Méra and a lifetime of screaming Gypsy violin. For a lot of Hungarian folk musicians, Árus is probably remembered more as a dancer than as a fiddler. In any case, Árus Feri was a dancer the likes of which you don't often see these days. After the fall of Ceaucescu, when Romanians could travel freely, Feri used to stay with me in Budapest quite often. He was a wonderfully pre-modern visitor. I remember him showing up unannounced one night, so I served him a quick meal of eggs, onions, bread, and a big jar of homemade mayonnaise. After eating most of the mayo straight with a spoon he said "Thanks. I really liked the liquid bacon. What will they think of next! Liquid bacon!" Another time I found him trying to explain my job - newspaper editor working on a PC - to a group of Gypsies in the market. "Bob watches TV all morning, and then he taps the news into a telegraph - tap! tap! tap! that goes to the printing press and out pops the newspaper." 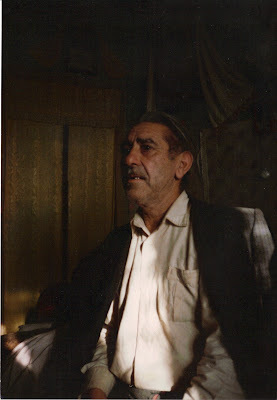 Feri passed way in 1996, about three weeks after I last visited him at his home in Mera. He had a sudden heart failure, which spared him the experience he dreaded most - ever having to visit a hospital. As far as Feri was concerned, hospitals were the main cause of death - in strictly empirical terms, he explained, you see lots of people go into hospitals and never come out, so he wasn't setting foot in one. It hit me pretty hard when he passed, but a bit of him lives every time I pick up a fiddle and put a bow to the strings. Budapest is not exactly a city that attracts a lot of immigrants, and although you can find non-Hungarian food, this city is not exactly an exotic foodie's paradise. There are ethnic restaurants, but with rare exceptions, they are expensive and mediocre, like a lot of the Budapest restaurant scene these days. Usually, if we want to eat Japanese or Chinese food, we wait until fate finds us in Vienna or Paris. Turkish food? - wait for a trip to Berlin, or far better yet, Istanbul. But one group has been in Budapest long enough to establish their own neighborhood hangouts - the Vietnamese. The Vietnamese came in large numbers during the 1970s, when the communist government offered scholarships and aid during the Vietnam War. A lot of the Vietnamese here grew up speaking flawless Hungarian, and being sharp business folk, a lot of them left for France and Germany after 1990, when the opportunity arose. Still, today we have a few places to eat Viet food - the Four Tigers market, for one, where the Vietnamese food stands seem to have completely pushed out the Chinese food stands from our favorite stall line in the back of the market. At Four Tigers Market Ft 600 gets you a pick and choose rice plate from one of the four Vietnamese lunch stands - and you can get cafe sua da, the iced expresso coffee that the Vietnamese adopted and improved on from their previous French Insect Overlords. And then there is our "local" Vietamese eatery - the Hanoi, located a ten minute bike ride away from us in our own sprawling district of Zuglo (Vezér út 129) It has been our private custom on Fumie's birthday to make sure she eats seafood, which is no small deal when you live in a landlocked country bounded by neighbors such as Slovakia, Romania, and Slovenia. So off we pedaled to try this place out - it has had hideous reviews, which noted long waits for food, a totally disorganized and unprofessional staff, and one report about a fight breaking out during dinner. Sounds just like my kind of place. We sat ourselves in the garden, which is possibly Budapest's only actual bamboo grove authentically strewn with bottle caps and ciggy butts, and checked out the menu. And damn, it actually is Vietnamese! This ain't no "Kinai Bufe" serving canned sweet and sour, this is the real deal! We started safe, with pho, the national soup with rice noodles (FT900) which is perfect for a scorching hot afternoon meal as long as somebody else is laboring in a hot kitchen preparing it. Pho is pronounced "fuh" as if you were cussing somebody out but thought better of it on the first syllable. Fumie, of course, tried the seafood pho (FT 1400) which had a hefty amount of shrimp, squid, and mussels floating in a spicy broth. Since she grew up in the seafood capital of the Universe, located on Tokyo Bay, she was satisfied with the huge shrimp and squid which disappeared down her gullet in a wink. These creatures did not die in vain. They died in Fumie's soup, or on their way there, at least. Next she turned to the side dishes: shrimp wrapped in rice paper filled with rice noodles. These were not the best in the world... but then, we realized that there did not seem to be any aged Vietnamese grandmas tottering around the place, which is usually the sign of a great Viet kitchen. No, these were just teenagers, it seemed, and they had lived in Budapest so long that they didn't feel their rolls had to compete with some street stall selling amazingly delicious shrimp rolls on every corner as they might in Saigon, or Paris, or New York... or even Hollywood, Florida. The same could be said for the fried nem. Ordering these in Hungary is always a linguistic treat - nem means "spring roll" in Vietnamese, but it also means "no" in Hungarian. I lived with a dozen Vietnamese during college, so I usually call them, simply, nem. I want some nem! Vietnamese nem, in fact, played a central role in the long ago drama that led to the happy abandonment of my adolescent state of of virginity, but that is another story and not one for the printed page. These nem were perfect, but the dipping sauce was a bit uninspired - nothing more than a bowl of fish sauce - and a bottle of Sriracha sauce. All in all a fine meal, but not outstanding. One of these days we will go back and order from the non-soup menu. When I have a wad of cash. This is a modest restaurant but not a cheap one. Most of the seafood items are justifiably pricy, but this seems to a be a place where the local Vietnamese community goes when it needs to celebrate and not count pennies in public. And who knows... maybe we were just unlucky - perhaps somedays there are some Vietamese grannies in the kitchen.